This pull toy and activity center combo will show toddlers that the square peg really cannot fit in that round hole! Loaded with elements for toddlers to explore: shape sorter, bead run and spinning fireman/dog. 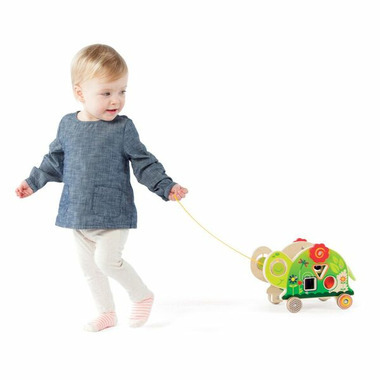 When ready for a walk around the dining room table, grasp the yellow cord and watch the rubber trimmed wheels roll this little firetruck round and round. Fosters motor skill development. 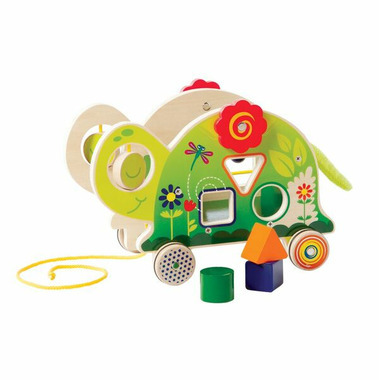 Ingredients: All wood toys have non-toxic water based finishes. Caution : Surface wash only. This product meets or exceeds EN71 and CPSIA safety regulations.